I wanted to do more than just look. There was something unsatisfactory about this mere looking. Most visitors to the Grand Canyon make the leisurely drive along the South Rim, stopping off at a half dozen or more observation points where signboards attempt to convey something of the wonder that is laid before them. They gape, they ooh, they aah, they point at the vast rock formations, they crane their necks to catch a glimpse of the river far below in the Inner Gorge. They get out their mobile phones and take pictures of one another, smiling at the lens, with the Earth’s greatest spectacle as backdrop. As a natural wonder the Grand Canyon has no equal. Water, wind, ice, time, gravity, and plate tectonics have conspired here to create the largest canyon on earth, a chasm so vast that you could drop Norfolk into it and it wouldn’t touch the sides. It is a vertical mile deep, and averages ten miles across. It runs 277 miles from one end to the other. There is no standpoint on our world that offers anything more than a partial view. The only complete photographs are taken from space. The Pauite Indians called it Kaiuw A-vivi, or Mountain Lying Down. It is a recurring idea, this image of the canyon as an inverted mountain plunging deep into the earth. If you flipped it inside out it would be higher than Mount Fuji. But it would be a mountain like no other, a baroque mountain, a mountain of fantastical flourishes, adorned with buttresses and pinnacles, with weird turrets and fantastic ridges, a mountain of surreal colour and extraordinary form. I wanted to toil a little in the labyrinths. I wanted to escape the confinement of the observation points which seemed so tamely inappropriate to this breathtaking vision. I wanted to connect with the grandeur of this place. The Canyon was far too spectacular for just looking. I needed to get under its surface, to get beneath the rim. Of course that was before I had met Vince. The Grand Canyon lies in northern Arizona in the American Southwest, a skeletal land where the earth turns bare bones to the sky. It is the kind of country where every time lift your eyes you see a hundred miles. Sagebrush rolls across these vast distances without fear of snagging on a picket fence or a parking meter. Physical landmarks tend to the extraordinary, the convoluted, the spectacular. Filmmakers have flocked here for dramatic backdrops. In Monument Valley John Ford cried action to cowboys, Indians, and stagecoaches. At Stillwater Canyon, on the Green River, Max von Sydow delivered the Sermon on the Mount to a crowd of locals in false beards and tea towels. Further upriver Thelma and Louise drove their car off a mesa cliff into screen immortality. It is a land of canyons, all of them overshadowed by the Mother of All Canyons. The afternoon I arrived, I found the Canyon in apocalyptic mood. Storm clouds were descending on the South Rim headlands. I dumped my bags and rushed out to Hopi Point to catch the best of the weather. To watch storms brewing over the Grand Canyon is to glimpse Judgement Day. Dark curtains of rain opened and closed over the buttes and mesas, the pinnacles and turrets that loom out of the Canyon. Thunder shook the air, lightning bolts struck the North Rim, and the winds cut across the exposed point like sabres. ing its first waves of visitors. Built in colloquial style, it is a cross between a Swiss Chalet and what came to be known as National Park Rustic. 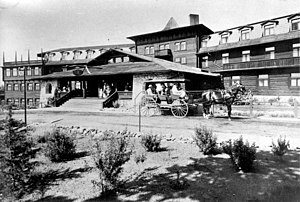 A century on, the El Tovar is still the place to stay among the myriad accommodation options on the South Rim. In style it is more Teddy Roosevelt than Paris Hilton. It was like staying at your great aunt’s house. The service has a faintly disapproving air, and you knew it wouldn’t do to be late for your dinner reservation in the restaurant with its white-aproned waiters, its sticky puddings, and its bracing views of the Canyon. Cheery fires burn through the winter in vast stone fireplaces in the lobby. In the upstairs gallery are deep old fashioned sofas, turn of the century paintings of Canyon views and a piano where Paul McCartney once sang Hey Jude to fellow guests until someone asked him to keep the noise down. For the Hopi, one of several native tribes who count it as part of their ancestral lands, the Canyon is one of the sipapu or holes from which the ancestors emerged to inhabit the earth. 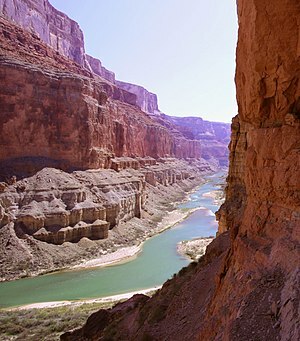 Early Europeans, too often in a hurry to get somewhere else, saw the Canyon only as a barrier. The first to arrive were a party of Spanish Conquistadors who came looking for the fabled cities of gold in 1540. They spent three days on the South Rim failing to find a way to descend to the river. Unable to appreciate how deep the Canyon was, they reckoned the Colorado river to be only six foot wide. When the scouting party returned from below the rim, they described rock formations as ‘bigger than the great tower of Seville.’ It was the first of many failures to convey something of the scale of the Canyon. If you dropped the great tower of Seville into the Canyon it would look like a twig on that six foot wide river. The Sierra Madres would hardly have been an adequate yardstick. The nine men were a ragtag party of hunters and trappers, mountain men and drifters. Some were prompted by the rumour of gold along the banks, others by a sense of derring-do, at least one just hoped to escape the army. They were led by Major John Wesley Powell, amateur naturalist and Civil War veteran who had lost his right arm fighting for the Union at Shiloh. Powell was funding the expedition out of his own pocket. They set off in May of 1869 on the Green River, the Colorado’s chief tributary, with Powell lashed to an upright wooden chair in the bow of the lead boat from where he could make his notes. But what began as scientific enquiry soon degenerated into a fight for survival. As they neared the Grand Canyon the waters quickened, and disaster loomed. One of the boats was smashed against the rocks and swept away downstream. One of the men, believing the whole exercise was doomed, abandoned the expedition. The rapids and cataracts seemed to come one after another now in almost unbroken sequence. One moment they were baking in oven temperatures between sheer cliffs, the next they were shivering, wet and sleepless on meagre beaches. Food began to run out. They survived on musty apples and rotten bacon. At Separation Rapids three more of the men felt they couldn’t take it any longer, and set off to climb up to the rim. They were never seen again. It is believed they were murdered on the way out by Pauite Indians. Ironically the expedition was only two days away from the Canyon’s end and safety. In spite the intoxicated prose, Powell’s book was a great success. Illustrated with a series of wonderful woodcuts, made from Powell’s own photographs, it brought to the American public for the first time the beauty and romance of the Canyon. It would ensure that it did not remain ‘unvisited and undisturbed’ for long. By the 1890’s, groups of visitors were arriving from Flagstaff, 12 hours over bumpy roads, to a point on the South Rim known as Grand View. They stayed at the Grandview Hotel, hastily built by Pete Berry, a copper miner, enjoying comfortable beds and meals by a European chef for two dollars a day. They took buggy rides along the rim and mule rides down a choice of trails into the Canyon. The world had changed since the 16th century and the Spanish Conquistadors. The romantic notions of the 19th century had engendered the idea of the picturesque. America was ready to embrace its greatest wonder. The options for exploring the Canyon have improved since Powell’s day. It is no longer necessary to be swept away in cataracts or to be murdered by hostile natives. There are white-water river trips taking in the 161 set of rapids that got Powell and his gang so wet. There are rim to rim hikes, dropping down to the river and up the other side. There are mule rides to the bottom of the Canyon and back. There are helicopter and fixed wing flights over the Canyon. The choices are almost endless. I decided on the trek that defeated the Spanish Conquistadors — a hike to the river and back. Though it is just over 17 miles, it would require a minimum of two days. I booked a bed at Phantom Ranch, the only accommodation inside the Canyon itself, then trotted along to the outfitters store in the Park. It was an emporium for the fit, the athletic, the adventuresome. I felt out of place immediately. My shop assistant did nothing to ease my discomfort. His name badge declared him to be Vince from Texas. Square-jawed, crew-cut, trim as a blade of grass, Vince looked like he jogged back and forth to the bottom of the Canyon before breakfast. When I told him about my plans, he pursed his lips. ‘Coming up is the equivalent of running a marathon,’ he said. I nodded. In Vince’s company I felt manly silence was probably the way to go. He looked at me for a long moment with flinty narrowed eyes. I knew what he saw. He saw someone who was not a marathon runner. I gave him a guy kind of nod. ‘What kind of training you been doin’?’ he asked. ‘Oh, you know, the usual.’ I muttered. I was getting breathless just talking to Vince. I felt I needed to divert the conversation from me to equipment. ‘What kind of backpacks you got,’ I asked. ‘I reckon about 30 litres would do it.’ I got this technical bit of info from glancing over Vince’s broad shoulders. A label on a smallish pack read 30 litres. It might have been better not to get Vince going on the technical stuff. He was to technical jargon what Conrad Black is to financial chicanery. For Vince drinking water was ‘hydration’, and perspiration wicking was a legitimate topic of conversation. I tried to lighten the atmosphere with a joke about camel backpacks, the ones with a drinking tube so you can drink without the exhausting business unscrewing a bottle cap. But humour wasn’t Vince’s thing. I bought some of those energy bar things, a sort of congealed muesli. I thought Vince would be impressed. I had no idea what Vince was talking about. In the end I just took whatever he gave me. Later when I looked through the bag I found a leaflet about the dangers of hiking in the Canyon. Presumably it is part of everyone’s purchase, but I couldn’t help feeling it was Vince’s personal message to me. It was winter, and the top of the trail was snowy. I slipped a pair of crampons onto the bottom of my boots and set off at a jaunty pace. Walking downhill is a joy, for the first hour or so. The passage of hikers and of the mule trains had beaten an easy path in snow, and the day was bright and sunny. All seemed well with the world until I began to encounter fellow hikers coming the trail. They did not inspire confidence. I looked into their faces as they passed and I didn’t like what I saw. At this point they had been climbing for seven hours. Most looked pretty rough. Quite a few were the wrong side of completely knackered. Two guys, twenty years my junior, more Vince than me, passed like zombies, their eyes glazed, their feet shuffling. But if the zombies were ominous, the fit people were just irritating. There weren’t many who showed no effect of seven hours climbing but I find it hard to shake of the memory of a couple, in matching yellow anoraks, striding past me with a cheery wave, like people out for a Sunday afternoon stroll on the Sussex Downs. I felt a surge of contempt. The Zombies were human. The Anoraks were not. Bright Angel Trail is one of the oldest in the Canyon. Originally it was used by Hualapai Indians to reach the springs of Indian Garden halfway down. In the 1890’s it became a miner’s route and by the turn of the century was the main route into the Canyon for tourists. Like many Canyon trails the Bright Angel makes use of a fault in the Canyon walls which allows passage across the Coconino Sandstone and Redwall Limestone, two of the most difficult bands of rock. Any descent into the Grand Canyon is a journey through geological time. On the Canyon walls and escarpments, the different layers of rock represent different geological ages, and different origins. But all have something in common — they were created in a marine environment. Here in the middle of the continent, in this parched land, unnamed tropical seas came and went over the space of millions of years with their layers of mud and silt, tides and dunes, fish and reptiles. The echoes of this lost waterworld are locked in the walls of the Canyon. The top layer, the Kaibab Plateau, was formed only yesterday — a mere 270 million years ago — from the soft mud on the bottom of just such a shallow tropical sea. The fossils show evidence of sharks and squid-like creatures. Next is a wide band of white rock known as Coconino Sandstone which is composed of petrified sand dunes. Geologists recognise the marks of wind, of the blowing sands, in the rock. Fossil include reptiles, spiders and scorpions. Below this are the Hermits Shales where you find fossils of ferns and primitive conifers which once grew in the mud and sandy silt of a river delta or a coastal wetland. By the Three-mile Resthouse walking downhill had long since ceased to be a gentle lope. My calf muscles were beginning to throb, and my feet, pressed continually forward, were aching. I sat down in the open-sided rest house and took out one of my energy bars for a snack. It was like munching through stale cardboard. Part of me wished Vince was along. In the shop he had seemed intimidating. I know thought of him as inspirational. I was in need of his air of steely confidence, or at the very least, the packet of instant hot Irish stew that he would almost certainly would have been whipping up at this point in a triple coated, hermetically sealed, stainless steel, double glazed 2 litre thermos flask with built-in spoons and a moulded drinking spout. Instead I got Melvin who shared his packet of raisins with me. Melvin was hiking up, and arrived at the resthouse a few minutes after I did. One of the striking features of the Canyon was the sheer variety of people on these forbidding trails. There were 60-something grandmothers, there were Japanese school girls, there were families with 2.2 children. But Melvin seemed to belong to an identifiable type — the middle-aged man, often alone, pitting himself against one of the Nature’s greatest feats. Presumably the Canyon was all part of a mid-life crisis, the hiker’s equivalent of buying a Harley Davidson. Melvin was a salesman from Winnipeg. Over the raisins I understood that he was suffering from blisters and a sense that his life wasn’t going anywhere. Yet Melvin still managed to be philosophical. With the raisins finished, we struggled to our feet and shook hands. By Indian Gardens, another a mile and a half down, my legs were killing me. My calf muscles felt as if they were on the rack, and my Achilles tendons seemed ready to snap. My feet seemed to have grown three sizes inside boots that had inconveniently remained the same. I sat on a bench among prickly pears, and ate another energy bar. The springs at Indian Gardens have created a small oasis here on the dry flanks of the Canyon. It is one of the oldest inhabited sites beneath the rim; in prehistoric times it was cultivated by the Hualapai. These days there is a ranger station and a camp ground. The campers at Indian Canyon were the last people I saw before I reached Phantom Ranch. For the next two and a half hours I had the Grand Canyon entirely to myself. I followed the trail as it crossed the Tonto platform onto Tapeats Sandstone, a sedimentary rock whose top layers still hold the waves patterns of a Cambrian sea. I was grateful for the gentleness of the petrified surf. 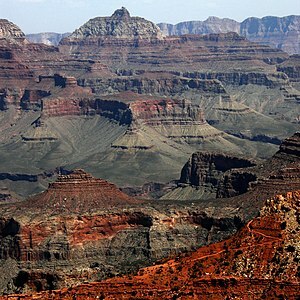 The creation of the Grand Canyon is a complex business involving deposition, erosion and plate tectonics. But the Colorado River is the chief culprit. One of the continent’s great rivers, it drains an area of 250,000 square miles, over two and a half times the size of the United Kingdom. The Hualapai Indians knew the river as Hautata or Backbone of Mother Earth. Tumbling down from the Rocky Mountains with a gradient 25 times greater than the Mississippi, it is a fearsome beast in full flood. It has taken it just 5 million years to carve a vertical mile through the earth’s rock strata. Perhaps I expected something on an Amazonian scale but when I finally emerged at the Colorado I found it hardly wider than the Thames at Richmond. Pressed between thousand foot walls of dark grey granite, the river was the colour of wet clay. The walls of the Inner Gorge are the lowest layer of Canyon rock –known as Vishnu Schist or the basement rocks. Almost two billion years old, they contain virtually no fossils. They belong to the Precambrian era. I pressed my palms against the dark walls. I was touching some of the very foundations of the planet, from an age when life on earth had barely begun. An hour later, in the falling light, I hobbled into Phantom Ranch, a collection of log cabins clustered round a central lodge on the banks of Bright Angel Creek. It is the only place in the Canyon where trekkers can sleep in a bed. Anyone who was at prep school, or remembers the arcane regulations of youth hostels of thirty years ago, will right feel at home at Phantom Ranch. There were two sittings for dinner in the main lodge. Guests who had the presumption to arrive a few minutes early were obliged to wait outside on the steps, in my case in the rain, until the doors were opened on the dot of seven. Feeling like wayward school boys we filed in to take our places at long tables; I found myself looking round to see who was table monitor. In the dormitory cabin the bunks were squeezed in so tightly I could have suffocated the man in the next bunk with my pillow without needing to get up. It was a tempting idea. Of the nine other men in the cabin, seven snored like runaway trains. The other two presumably were the owners of the boots that smelled like rotting possum meat. The following morning, after a colossal breakfast and a bit of stiff-legged limbering up, I was more or less mobile. It helped that I was going uphill. The first couple of hours involved a stack of switchbacks out of the Inner Gorge. In places the trail was like a staircase, carved out of the rock. At the ridge known as the Tipoff the trail levelled briefly onto the Tonto Platform. I paused to admire the views of the Canyon. When I turned back to the trail I found two mule deer standing a little way off to the left gazing at me, their big ears splayed, their heads tilted quizzically. They had appeared so suddenly, they might have been apparitions. I stooped to lift my pack and when I looked again they were gone. I climbed on towards the Redwall Limestone. By the time I had reached the switchbacks known as the Red and Whites, it had begun to snow. It fell gently at first, barely settling on the exposed rock, but thickened as I went. This winter storm was not descending on the trail; I was climbing into it. With a difference of almost six thousand feet in altitude, rim and river are often different seasons. By the time I reached Skeleton Point, two foot of snow blanketed the rocks. I stopped for lunch, huddled beneath a rock overhang. Phantom Ranch had provided a packed lunch — a hard bagel and soft cheese that you squeezed out of a foil wrapper. It wasn’t as good as it sounds. I climbed on into a white world, skirting O’Neil Butte and Cedar Ridge. Snowflakes spiralled down out of a pewter-coloured sky in slow graceful circles. I climbed in a strange silence broken only by the soft crunch of my boots in the snow. Beneath me the Canyon had disappeared. When I turned to look down there was only a fathomless white abyss. Above me the rock faces disappeared into low clouds. I tramped on through this dream world for a couple of hours, following the faint outline of the trail beneath its white covers, barely aware of where I was on the Canyon flanks. And then, in mid-afternoon, emerging from all that Canyon silence, I heard a train hooting. It was so faint, so eerie, it was like the ghost of a sound, echoing down from the world of the rim. But I knew it was real enough. It was the daily train arriving at the Canyon from Williams with its cargo of eager visitors. Half an hour later I stepped up onto the rim. An hour later I was in the cosy embrace of the El Tovar Hotel, warming my toes in front of a fire, a mug of hot chocolate to hand. The next morning the sun was back. I drove along the South Rim, stopping off at a number of observation points. In the morning light, the panoramas were breathtaking. I realised I could spend hours looking at this Canyon, and never tire of it. No two perspectives, no two moments were the same. But it helped that I had done more than look. Far below I could see the trees of Indian Garden, the Bright Angel Trail snaking across the Tonto Platform, the river a vertical mile below me. And I felt, looking down into all that vastness, that in some small way part of it belonged to me. Stanley, you took me right into the canyon with you — and what a beautiful, sensory excursion it was. I’m so glad to have found your work! I’m a new travel writer; your Words and Wanderlust Silk Road piece precedes mine on the Grand Canyon, giving me a terribly tough act to follow. (I had a similar canyon experience, even met your Vince in my Vaughn — but I chose to raft, not hike.) Thank you for letting me return to the Colorado this morning from the safety of my armchair, and for your inspirational writing. You’ve set a new bar for me, and I’m sure I’ll be taking more journeys with you! Having just read your three books back-to-back, I’ve finally found a travel writer surpassing Jan Morris. She has made me long to visit places but you have made me feel I’ve been there. I can’t thank you enough.